Werner's Cairns blog: The People’s Republic of Queensland. 1. The People’s Republic of China. 3. 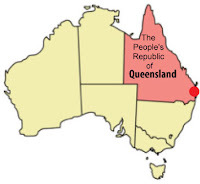 The Peoples Republic of Queensland. Now before you declare me insane, let me assure you that I have this information direct from the horse’s mouth, in other words from our own Kevin 07. “That if we’re serious about this principle that we’ll make a difference here in this community by being in this together. For the challenge, ladies and gentlemen, lies with you. Work with us. Work through your local members. Work through the local priority employment coordinator. There is no monopoly of wisdom on our part in terms of what’s going to work in this community. I know enough about local community life from where I come from the People’s Republic of Queensland - that everywhere is different, okay. Everywhere is different. And everyone’s got their own best ideas about how things should be done and you’ve got your own best knowledge and your own best networks.” Unquote. This just confirms what we've suspected for some time now - we no longer live in a democracy, but in a Blight dictatorship!